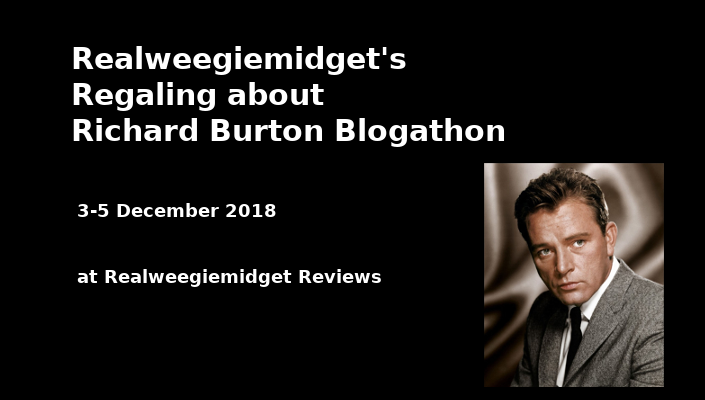 Come and join Realweegiemidget’s last Blogathon for 2018. The blogathon kicks off on the 3rd and ends on the 5th December 2018. You are welcome to join any day up to and including the 5th December. All you need to do is simply send me a link with your post on Burton, it’s as easy as that! 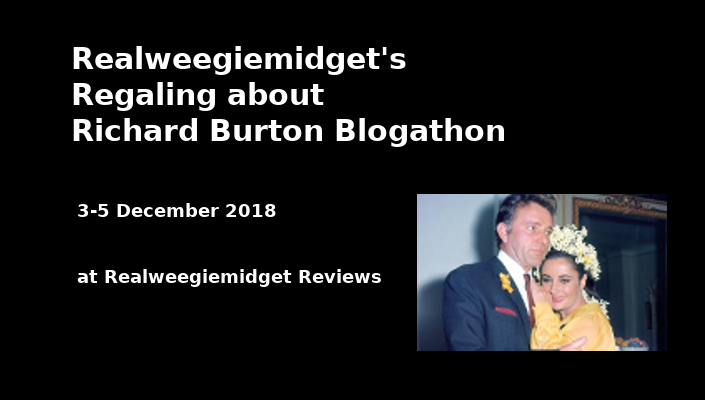 So far we’ve 28 entries on Richard Burton’s films, biographies and TV appearances… so if you keen to join or just find out who’s joined and what they are review just check out the Who’s Doing What Page… HERE is a link to that page.. where I will list all the bloggers and their entries. Don’t worry about time zones, as I will take these into account if you publish on the final day. CLICK HERE to a link to his Wikipedia page… and HERE for his Imdb page. And love you lovely lot of bloggers to join me… or anyone else who wants to celebrate Richard Burton. You can review ANY of his films, theatre or TV appearances. I will allow just the three duplicates for each topic, movie or TV Show. Review choices can be added as a comment on this page or you can contact me on my Contact Me page – either way please add the name and URL of your blog along with your movie or TV choice. Or you can send me a Direct Message on Twitter. I won’t accept posts which are uncomplimentary or disrespectful to Richard Burton, his life or his work. Add your Twitter handle so I can promote your post. You can only use new posts or new reviews. You can also add podcasts on him or his work but only if you send me the podcast link by my Contact Me page. Send your link to your post /podcast / video to me on the days of the blogathon. 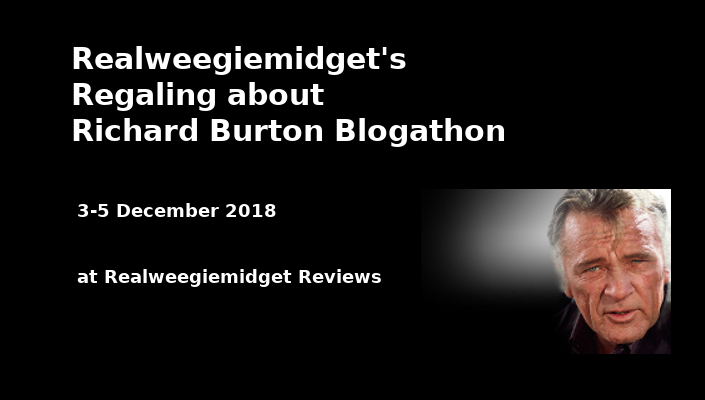 Last but by no means least, a teeny-weeny note: A sparking new blogathon will be announced here in January so keep your eyes peeled… and it’s revisiting an old Realweegiemidget blogathon for the 2nd year. And the subject close to my heart… or maybe, just maybe it might be on someone completely different. Thanks Debbie looking forward to reading your post, will be added to my post for tonight. Looking forward to it, Gill! And you have picked one of my all time favorites as well! We do have a very similar taste in movies, Chris. Hope all well with you. 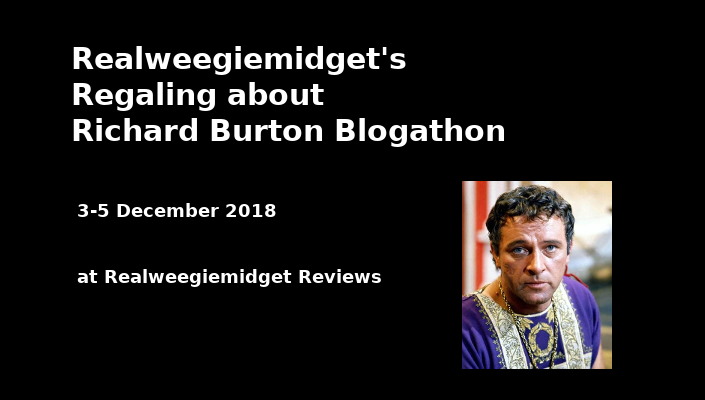 Looking forward to the Richard Burton blogathon! Looking forward to your entry as always Barry!